What is the cutest Christmas card that you received this year? Readers of this hub are about to see one of our favorites! 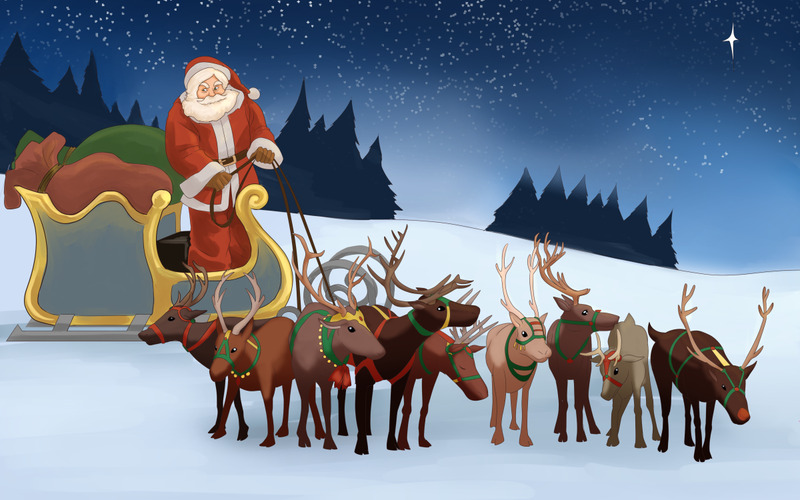 If you are like us, the Christmas cards arrive a few at a time early in the month of December and steadily increase coming in bunches each day and then trail off later in the month with a few really late arrivals. My husband and I happily read each card and notation or Christmas letter as it arrives and stack them to be enjoyed at least one more time before discarding them. A few special Christmas cards, especially those with photos, are worth keeping from year to year. I thought that you might like seeing our most favorite Merry Christmas greeting card in the nature of cute Christmas cards that made its way from a Peoria, Illinois post office to ours in Houston, Texas this year. 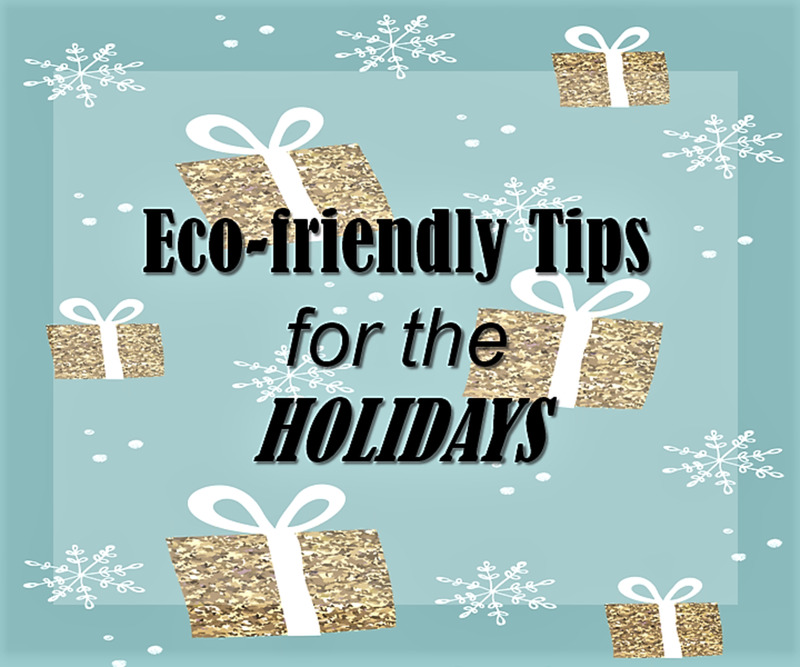 Many people like to personalize their Christmas cards with photos of their families, vacation scenery or pets as well as other subjects. 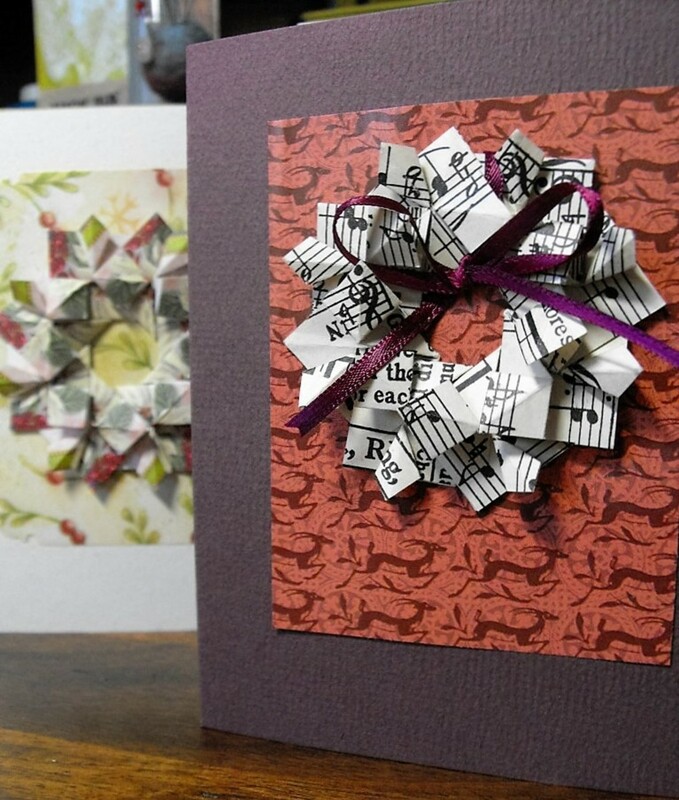 There is no limit beyond one's imagination as to what can be utilized to create a unique and pleasing greeting card for Christmas or any other seasonal greeting during the year. 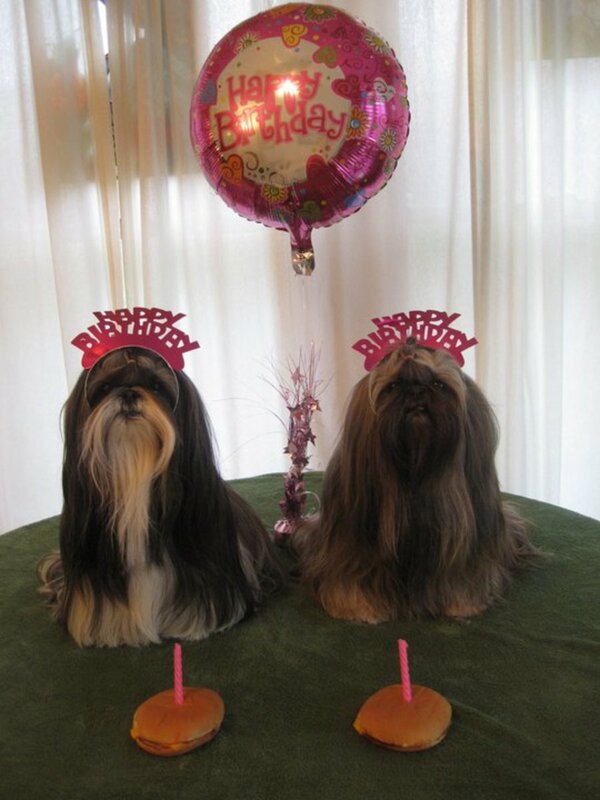 For my cousin Tom and his wife, Judi, they have the perfect subject matter with their pet Shih Tzu doggies. Not only are they darling little dogs, but Judi has more than a passing interest. 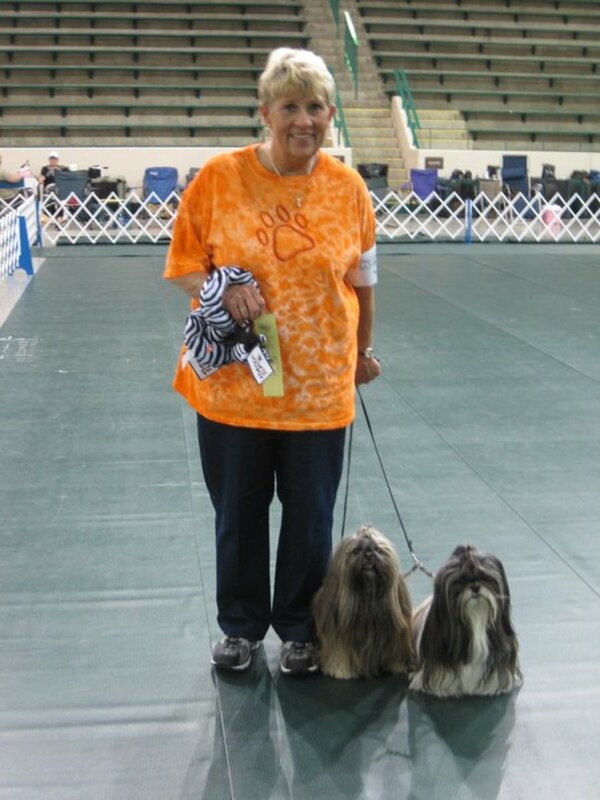 In addition to having these friendly canines as companions and pets in their home...she also grooms their Shih Tzu and trains them and has won many ribbons and prizes in shows featuring the aspect of obedience. Besides all of that, she is pretty handy with a camera...wouldn't you agree? Cooling Off From the Summer Heat. 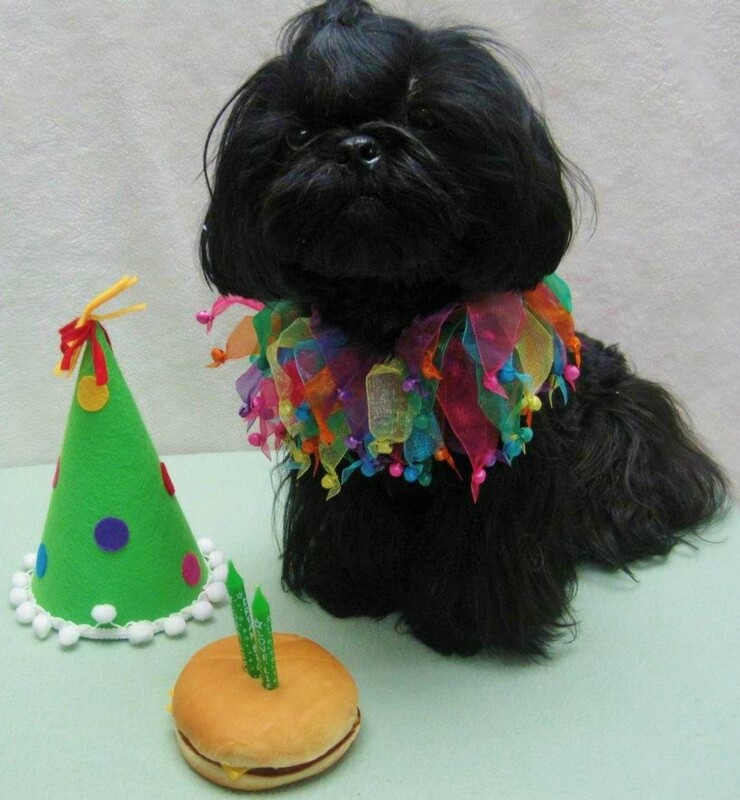 Judi likes to submit her Shih Tzu photos in competitions and last year won the grand prize from their local television station in Peoria for their Halloween contest. 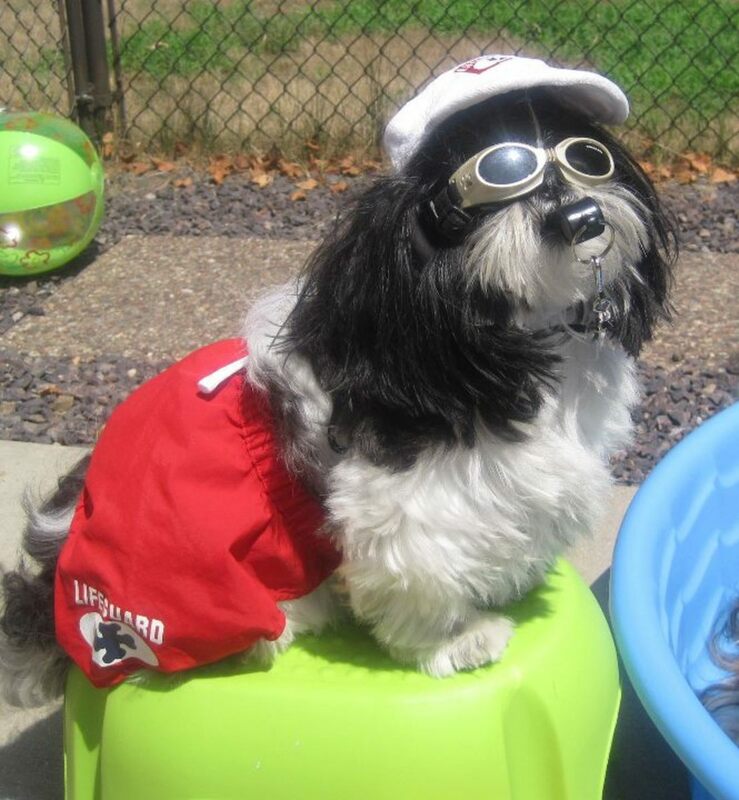 Her Shih Tzu pets love being dressed and from what she says they love posing for pictures. In fact, it is difficult to get a solo shot of just one dog without the others wanting to be a part of the scene. 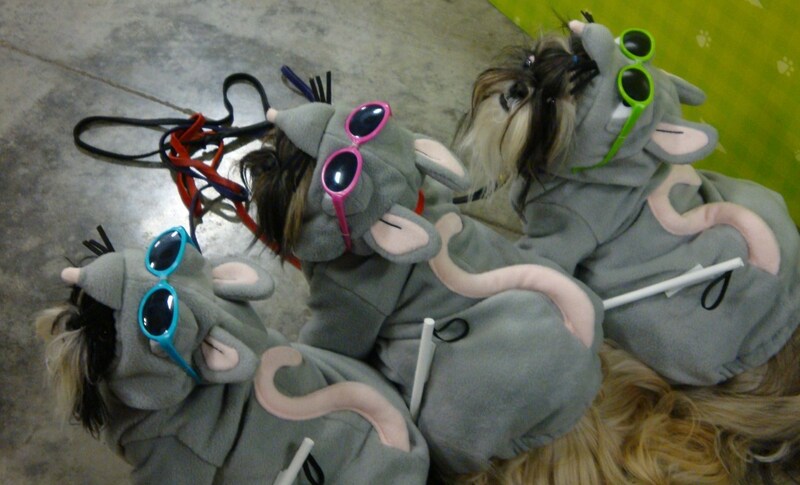 "Three Blind Mice" was their winning contest entry in the Halloween contest. Judi's doggies have been dressed one year as a "Chain gang." Another time they were the "Baywatch Beach Crew" and three of them were the swimmers, one was a shark and one the lifeguard. 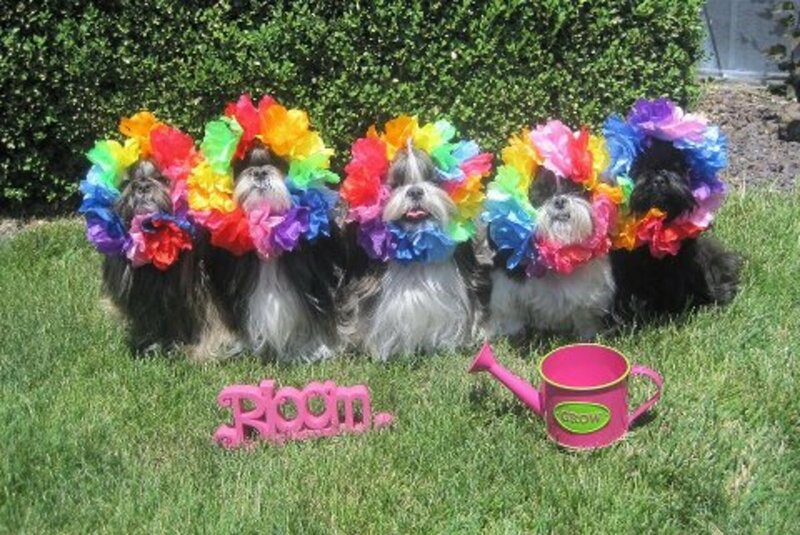 Obviously this is a fun pastime for my cousins and their Shih Tzu dogs also seem to enjoy the attention they get with the different pet wear that they sport. 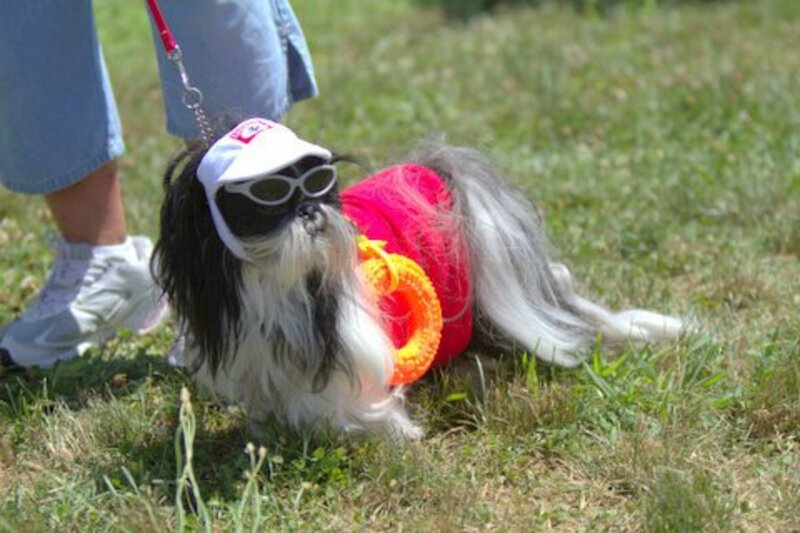 Whether one is dressing one's pets for contest entries or merely trying to offer them some added warmth when the weather is cold outside, there are many dog outfits that can be purchased. Everything from dog vests to dog coats, sweaters for dogs and dog jackets are available to keep your pets warm and fashionably attired. Is it raining outside and your canine friend doesn't like getting his feet or fur wet? No problem! Just get him some rain gear and dog boots and he will be ready to go outside and play or do other necessary "business." My mother once had a Lhasa Apso that loved wearing a sweater. In fact once he had it on his body he disliked having it removed and he fussed a bit each time we had to undress him whether it was to wash the item or because the weather was becoming too warm for him to still be wearing his sweater. We have had similar experiences with dogs that have been groomed through the years. Often they were given a new scarf to wear. They always seemed happy to be wearing them and seemed to dislike having them taken from them. If you bathe your dogs and they regularly wear a collar, they are always so happy to be given back their collars! I guess just as we humans like certain possessions, so do our canine friends. Do your dogs like wearing their collars and/or other clothing? Yes, they like sweaters and other clothing which keeps them warm. They like wearing boots and/or rain gear. They seem to like being dressed up in different costumes. They like a combination of the above. Nope. My dogs wear nothing. The Shih Tzu dogs have been in existence for centuries and were palace pets during the Ming Dynasty. 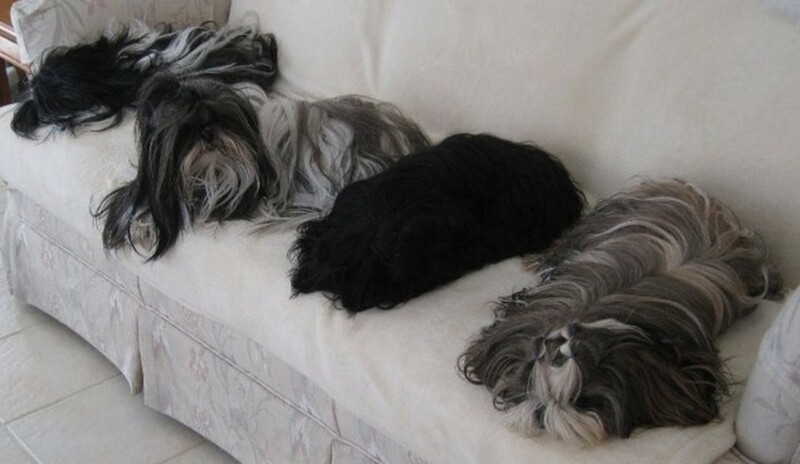 Supposedly they are a cross between the Lhasa Apso dog and the Pekingese. Discovered by soldiers during World War 2, they have increased in numbers becoming a most popular breed. Shih Tzu dogs are small making them a perfect size for people living in apartments. Unlike larger breeds who need more space to run, play and exercise, these smaller dogs can do fine with more limited exercise. They do need daily brushing and frequent grooming however. With their sweet personalities Shih Tzu love the attention that this brings making it easy to form a life long bond with these little beauties and cuties. My cousin's wife Judi spends countless hours training her Shih Tzu dogs from the time that they are puppies and continuing as they grow older. Obedience training has paid off not only in having well behaved dogs, but in a plethora of ribbons, titles and trophies for Judi and her pets. 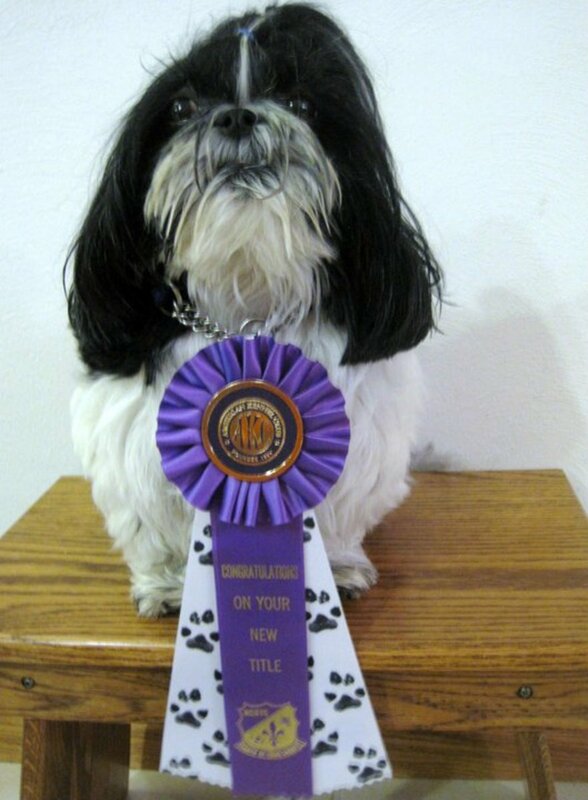 One of her dogs, Sofie, won the rating of High in trial at the Shih Tzu National Dog Show last year. Her registered name is Trinket's I'll Go First and she is #2 in the top 10 of her breed in the American Kennel Club Obedience ranking! This certainly attests to the dedication and effort in which she expends when working with her darling Shih Tsu babies. Shih Tsu dogs ( just like the Lhasa Apso dogs ) have an almost baby shape when holding them. Looking into those widely spaced and rounded eyes, they are sure to charm almost any kind of dog lover. 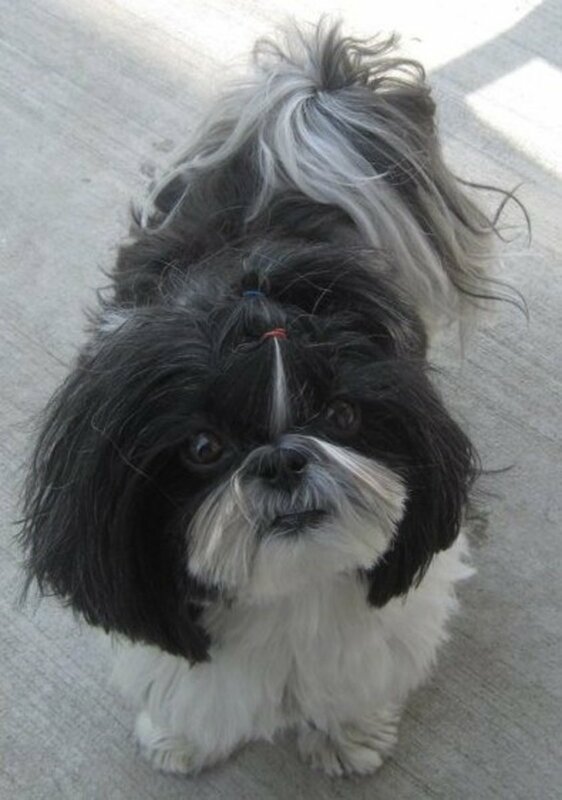 Judi and Tom's Shih Tzu dogs would entertain and please them even if they did not have a growing assortment of ribbons and titles. But...nice to know that other people also enjoy and appreciate the work that has gone into making them the "stars" that they are! Judi also teaches classes at the Peoria Obedience Training Club ( POTC ) in Pottstown, Illinois which is a part of the Peoria region. So if you wish for your furry friends to be as well behaved as Tom and Judi Gullickson's, and you live near Peoria, you might wish to enroll your family (you and your dogs) into some of these classes. Judi Gullickson not only raises and shows her champion sired Shih Tzu in various competitions, but she also grooms them. 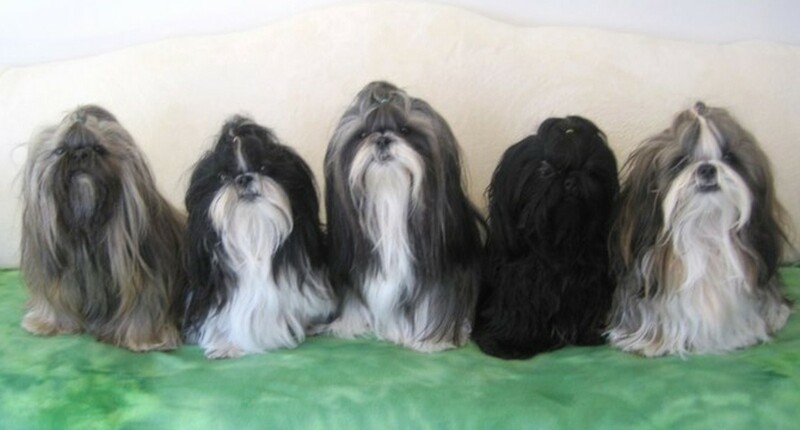 Judi's dogs are "in coat" which means that they are the long haired confirmation showdogs. This takes a lot of effort to keep their coats flowing and silky. 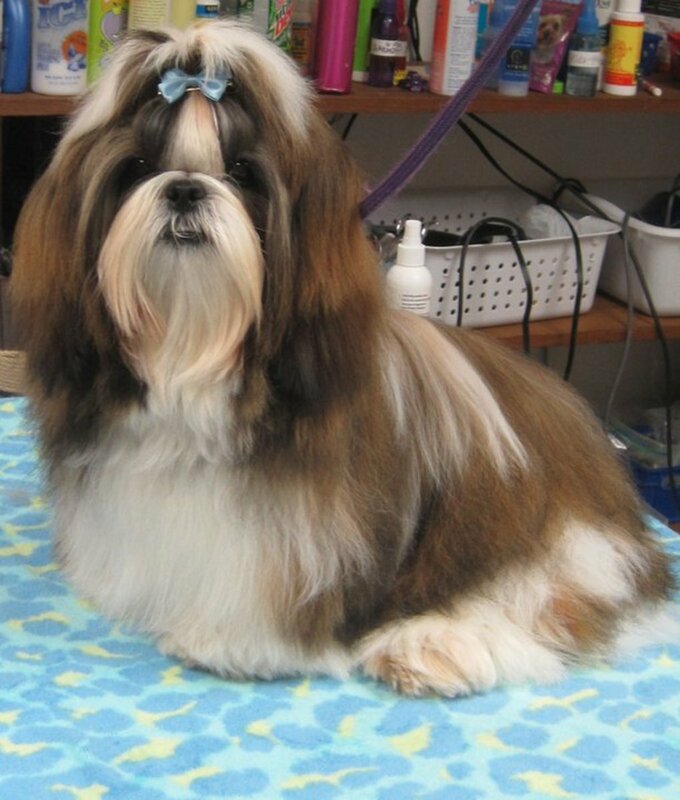 With a total of five Shih Tzu as a part of the Gullickson family, brushing sessions with each of them would be a part of a daily routine. 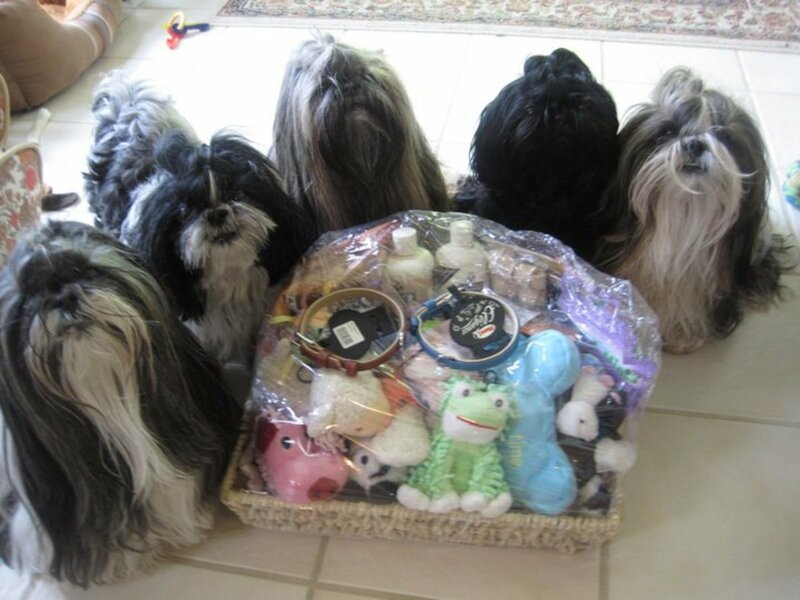 Suffice it to say, these Shih Tzu Gullickson darlings are well pampered and loved! Tender Touch Dog Grooming is the name of Judi's business in Peoria. 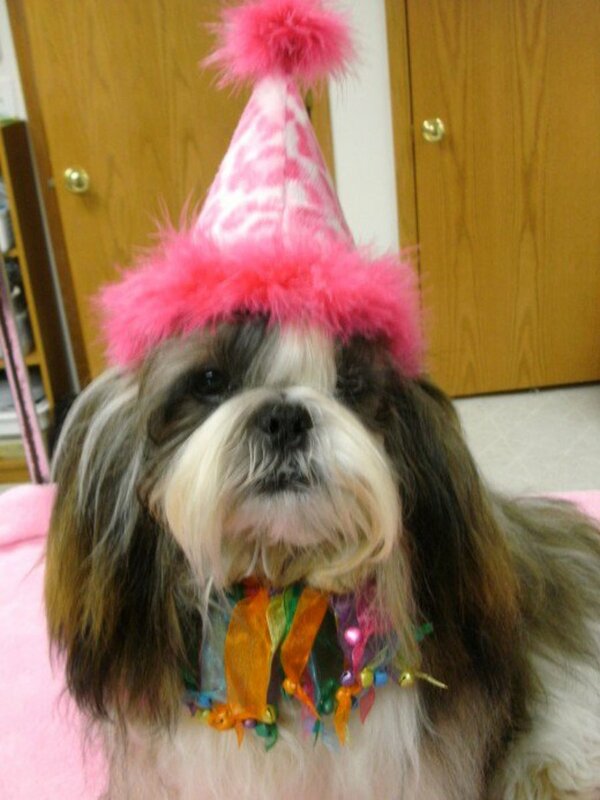 If you live in Peoria, Illinois and wish for Judi to groom your special Shih Tzu friend, they will be well tended. Most people who are not showing their dogs choose to have them trimmed in a shorter style which is easier to be kept matt free. Her friend and the breeder of Judi's champion sired dogs, Julie Burns, also works with her. The location of Julie's breeding business is Metamora, Illinois. By now you know why we really enjoyed our Merry Christmas Greeting Card from my cousins and have learned a bit more about their Shih Tzu prize winners, obedience training and dog grooming...all of which goes hand in hand with my cousin's great interest in showing and photographing their cute little (and no doubt well pampered) babies. What can they possibly do to top this year's Christmas card? Guess we will have to wait and see next year's pictures! Additional Photos Courtesy of Judi Gullickson. Peoria, Illinois where these Gullickson Shih Tzu's and "their people" live. I agree with you in that our pets are often more happy having another pal. We cannot always be at home with them. Those are so adorable. I am without a dog right now but if I get one it would sure look a lot like those baby dolls! Well and I think I will get two whenever I get one. Older I get the more I think about these things and what poor doggy wants to be alone? Everything needs a playmate. It would be fun to see those markets in India at this time of year from what you wrote. Glad you enjoyed this article. Lovely pictures and great ideas for Christmas cards and dog’s clothes. The markets in India are flooded with Christmas gifts and decorations. It’s a beautiful sight all around. No problem Sherry! Even though you meant to comment on someone else's post, it is nice to see you here. If you go back to the comment section on the hub, I believe you have the option to unfollow that hub. Glad to know that the cute photos of these dogs bring a smile to your face. Sending good thoughts and prayers your way! Now Christmas would just not be totally complete if I did not get to see the precious pups featured herein. They make me smile every time I see them. I am glad that these cute pictures made you smile. We just had our Thanksgiving yesterday in the U.S. with Christmas dead ahead! Wishing you an early Merry Christmas. LOL! now that made me smile! gorgeous photos! and great idea for the cards and doggy clothes! Thanks Patricia. Wishing you and your family a Happy Thanksgiving as well. So happy to know that this put you in the Christmas spirit. These photos taken by Judi surely do bring smiles to people's faces. Really fun to see the pictures. Makes me feel like Christmas. Hi I read this when you first posted it...and I knew that any time I needed a smile, all I need to do is come here. These little guys and gals (no doubt) are adorable. Thanks for sharing. That nap time photo is really cute. Enjoy your brother and sister-in-law's visit with their rescue dogs. Nice to hear where they get their "buddies." Dogs add so much to our lives! You will probably get one when you are ready. Nice to see these little sweeties again, they are too cute! The photo of "Nap Time" is my favorite with those big floppy ears all spread out like that. My brother and his wife are coming to visit tomorrow and will bring their two rescue dogs, they are so much fun to have around. I really should get a dog again. 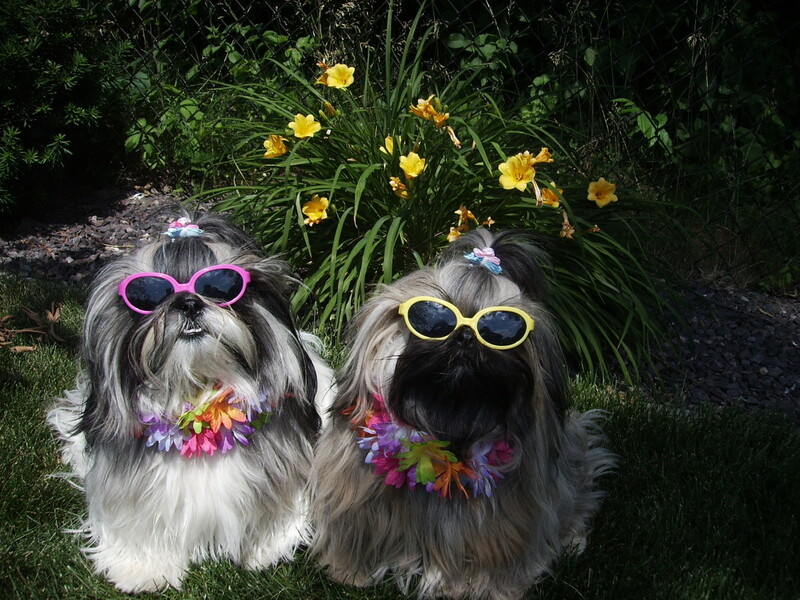 The cute Shih Tzu doggies certainly are cute. 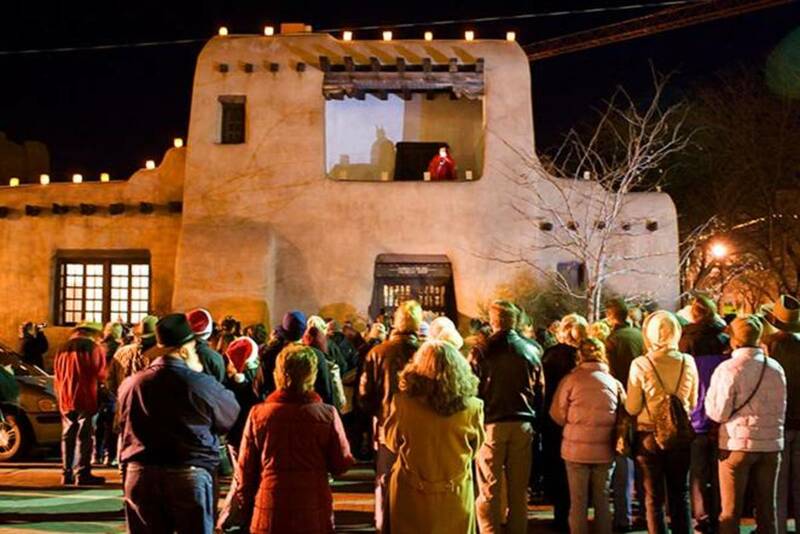 Wishing you a very happy holiday season and peaceful new year ahead. Loved, loved this!! Happy holidays Peggy! Wishing you a Merry Christmas and Happy and Healthy New Year to come filled with blessings and peace. 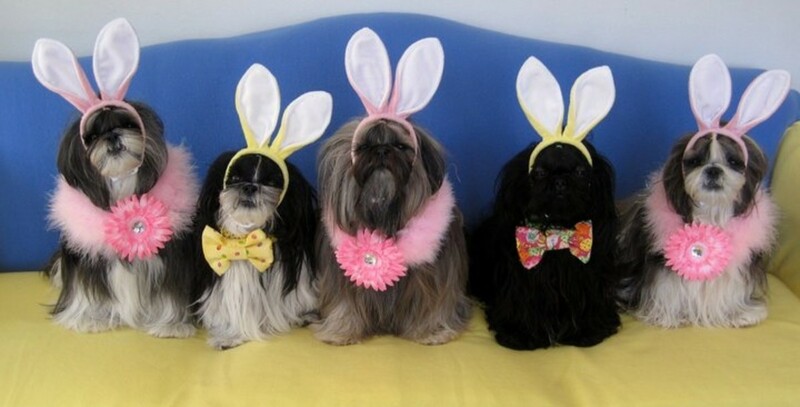 Appreciate the greetings and happy that the cute pictures of these Shih Tzu kids made you smile. Hi Peggy SInce you posted this the first time I try to stop and take a peek at the dolls!! How cute. Thanks for taking the time to share them with us. Your Chihuahuas would certainly be cute together if you could get them to pose. Snap lots of pictures! Maybe one or more will turn out great. Hope you are enjoying this holiday season. Let's all pray for peace in this world! How cute they are. I wish I could get my two little Chihuahuas to set for a good photo of them. Enjoyed your hub. Sharing and pin. 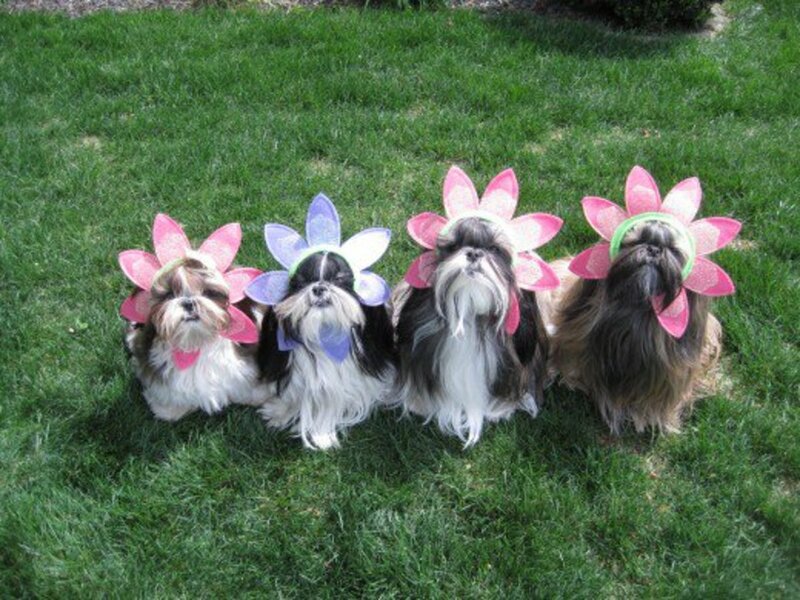 I agree that these photos are exceptionally cute of the Shih Tzu Kids. Judi...their two legged mother...is amazing with her photography skills! Blessings and hugs to you also! Enjoy this weekend before Thanksgiving. Peggy This is still one of the cutest puppy collections I have ever seen. Who cannot smile and get into the spirit of the season when looking at them. I love this page Peggy! I have two shih tzu's that I keep in full coat in Sydney, Australia even though I am certain that mine are probably not as well behaved as Judi's. 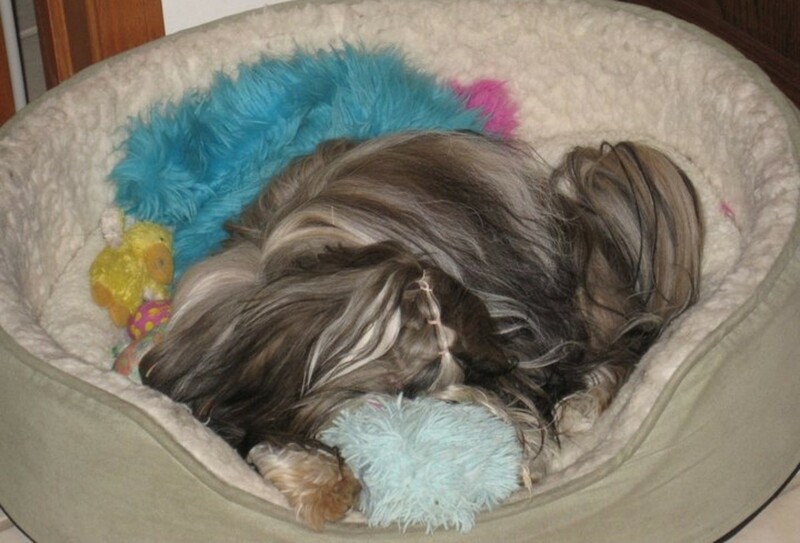 I am hoping that you might be able to help put me in touch with Judi to ask her a few questions about the cute props she manages to find to fit her shih tzus. If you can just pass along my email address (daniel_js_chik@hotmail.com) to her and ask her to contact me I would appreciate it so much! It will be fun to see their Christmas card this year. 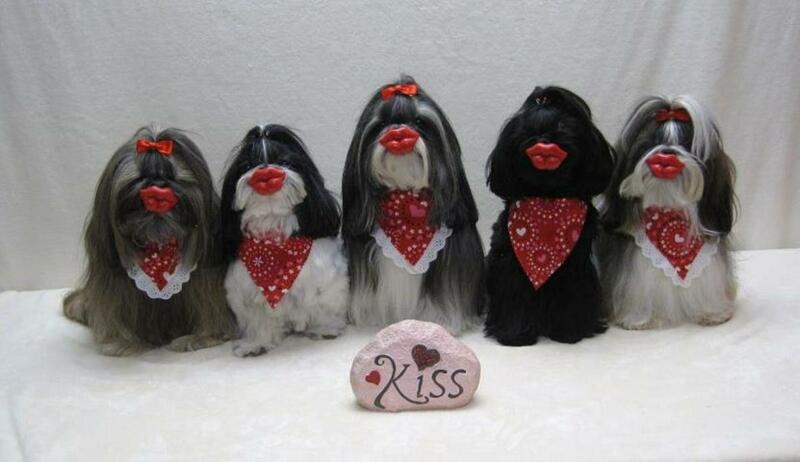 It is always cute as are their Shih Tzu dogs. Glad that this brought a smile to your face. Peggy, these are all so adorable. I would enjoy getting a card with these cuties on the front. What a nice post to end my day with! That is a cute photo as are many of them. 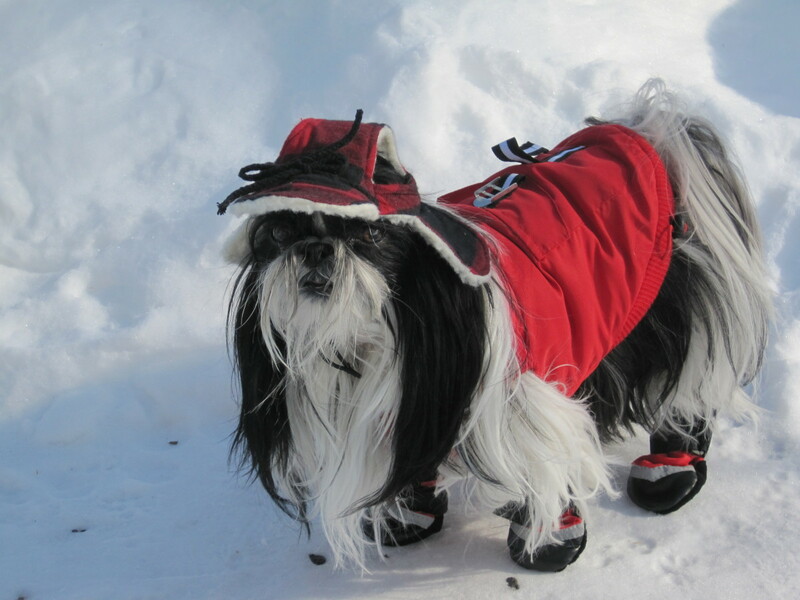 Just about every season of the year is represented by the outfits these Shih Tzu doggies are wearing. My cousin's wife obviously has fun with this! Thanks for your comment and the share. 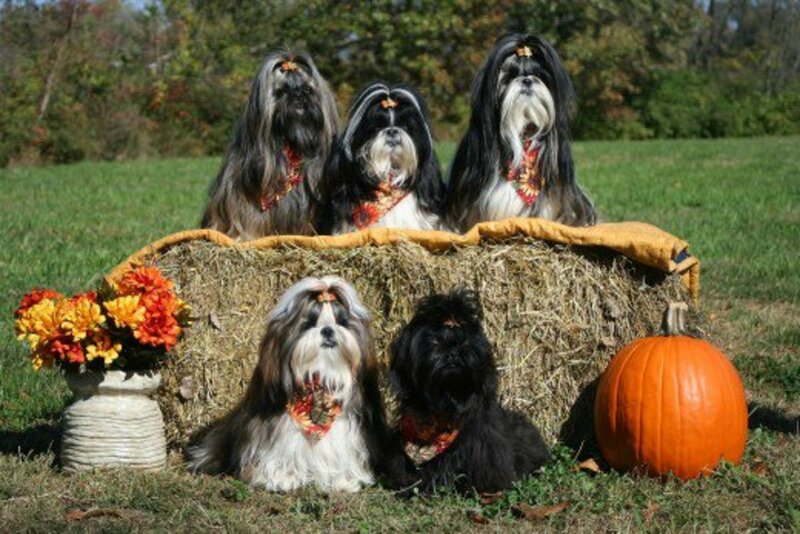 Thanks for sharing these very beautiful photos of these very beautiful and will trained dogs. 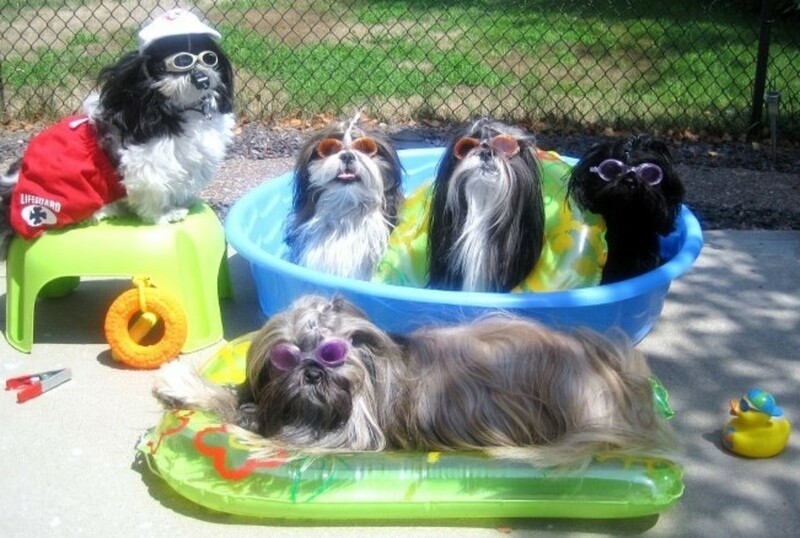 My favorite photo is Shih Tzu's cooling off from the summer heat ! 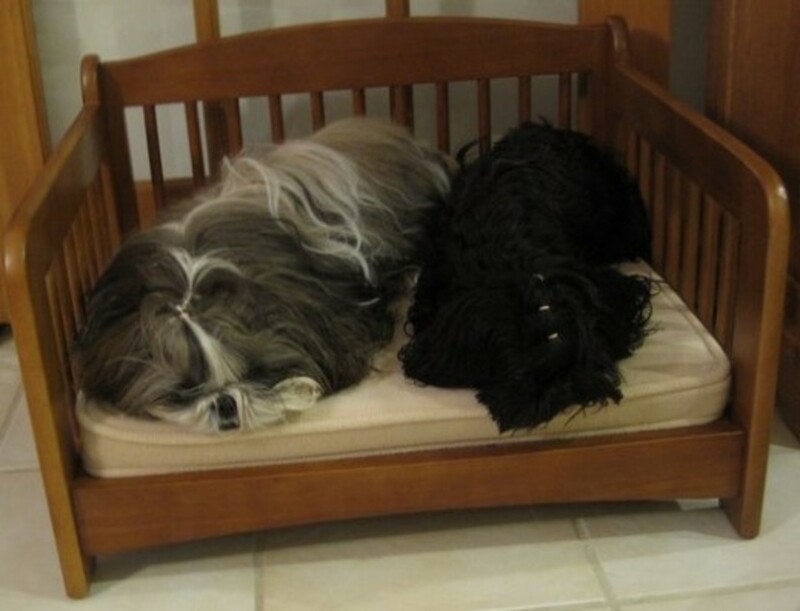 We have never had Shih Tzu dogs, but my cousins certainly love them. My mother once had a Lhasa Apso and he was a honey of a dog. Somewhat similar in size...although I am no expert. All I know is that we love our pets no matter if they are full blooded or mixed breeds. These Shih Tzu "babies" certainly bring my cousins great pleasure! Thanks for your comment. I love the ppictures. 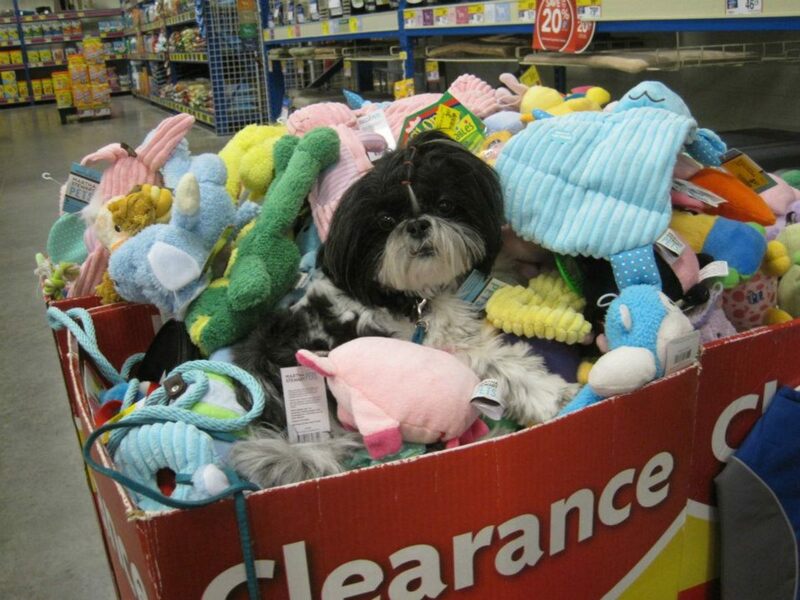 A shih tzu is a great dog to have. They're sweet, adorable and cuddly. I hope to see more pictures of your sister brood. Up and across the board. So glad that you liked this hub about my cousin's prize winning dogs. The costumes are just so cute!!! As to my followers...not yet in the millions. I wish! Ha! Nice seeing you here again in the comment section. Delightful hub, delightful dogs, and delightful Peggy, but 1.?M followers, who's counting, obviously not YOU. 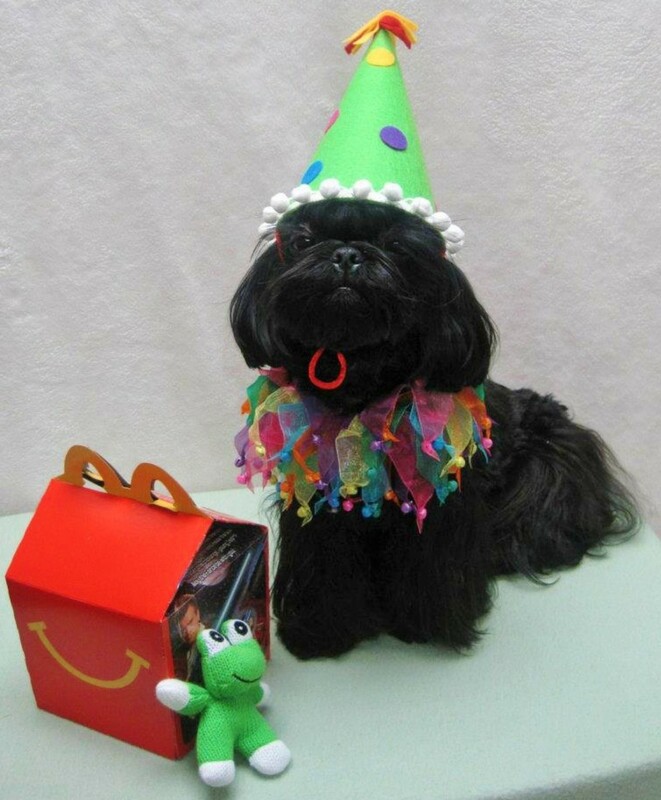 My cousins obviously have all kinds of cute costumes for their Shih Tzu dogs and have fun entering them in contests. That Halloween photo is cute, I agree. Thanks for your comment, votes and the share. 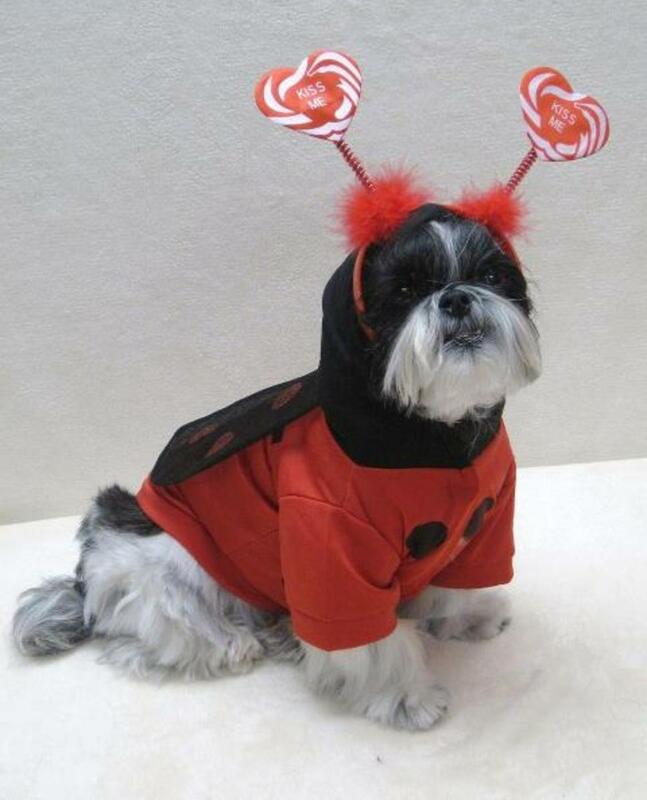 I guess if you like to dress up dogs, the Shih Tzu is the animal for you. Great pictures -- I like the pumpkin patch one the best. Looks like they're in Halloween costume. Voting this Up and Beautiful. SHARED. 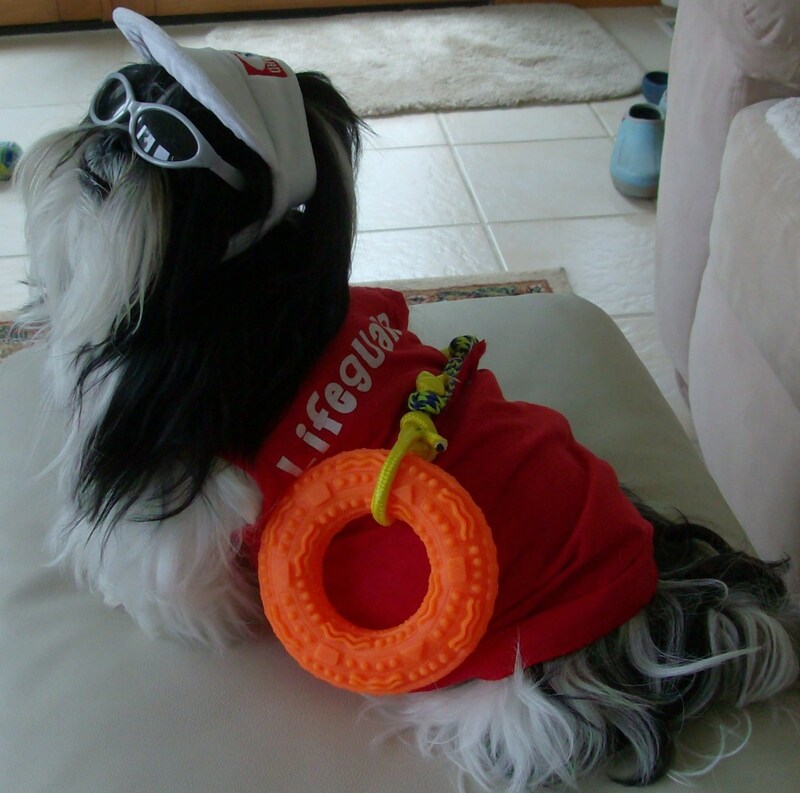 I have to thank my cousin's wife for all of these Shih Tzu photos. I will admit, they are certainly cute. Hope that your wish comes true someday and that you get one or more of these cute dogs for your very own. Thanks for your comment. 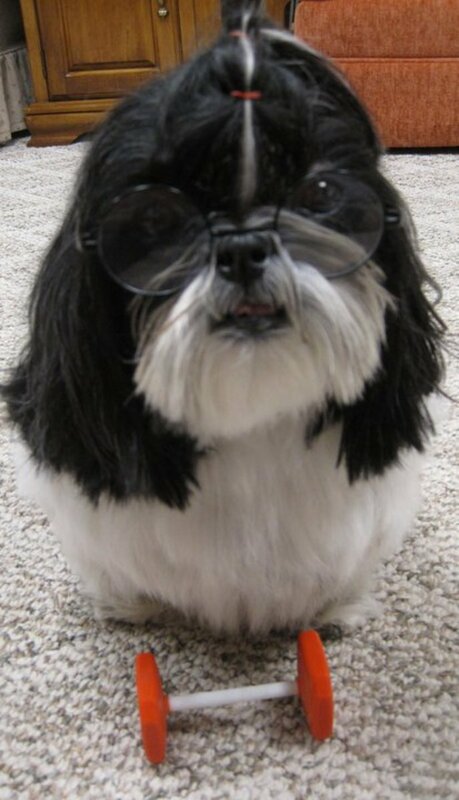 I would love to have a shih tzu. They are so precious and smart. I love all the photos especially the flowers.Nice hub! Thank you for the condolances on the loss of my mother. We were very close and I still miss her sweet and loving ways. From what you say, you have also felt the pain of losing a parent. Both of mine are now gone as are my brothers. Never thought that I would be the last one in my nuclear family since I was the oldest child. Yes, Skippy has a loving home as do both of our rescued cats, Dusty and Peaches. Oh, Peggy I,m so sorry to hear about your mother. . .It's never easy to lose a parent, I know. . . However, it's wonderful to hear that Skippy has a wonderful home with loving and caring people like yourself and your husband. We have not yet received our Christmas card this year from my cousins, so am looking forward to it. Am sure, given the history, that there will be another cute photo of their Shih Tzu dogs on it. As to my mother, she died last year and we now have Skippy...but yes...she was a remarkable and loving person who quite regularly rescued stray or abused animals. My husband and I have done likewise through the years as several of my pet hubs indicate. Thanks for your comment and votes. Merry Christmas! 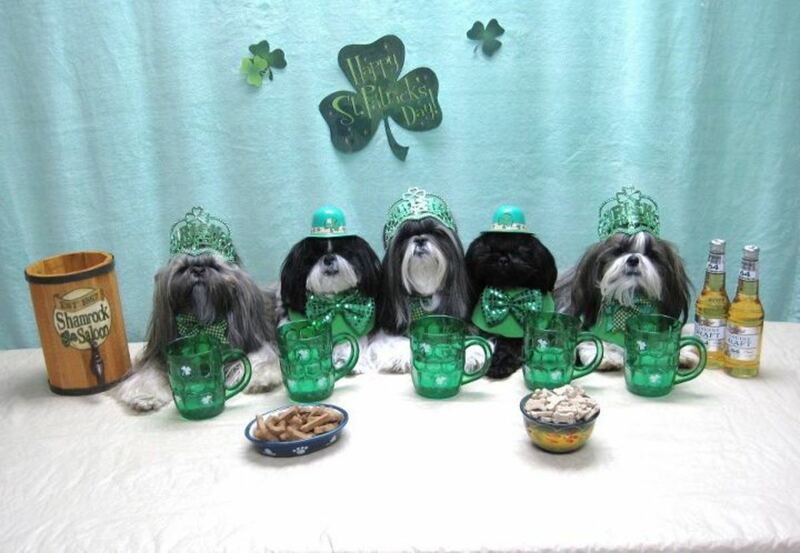 What a delightful hub and what an adorable group Shih Tzu dogs! Just to bad I'm not on your cousin's mailing list. I would love to see this year's Christmas card! Hehe! Peggy, I just loved this fun and very sweet hub! Please give my regards to your mom and Skippy. I'm always so happy to hear about remarkable and loving people like your mom, that will rescue abused or/and neglected animals. Bless her loving heart! So glad that you liked this hub about last year's Merry Christmas greeting card regarding my cousin's Shih Tzu dogs. Can't wait to see this year's card! Thanks for your comment, vote and sharing of this hub. These babies are absolutely gorgeous! My favorite is the "love' photo but really, they are all so cute it is hard to say that one or another is better. You obviously spent a lot of time and effort on this hub and it is fabulous. I voted it up and shared it on my social network. So glad I found this Hub. We have a Shih Tzu, and she is spoiled rotten. She just got over a bad experience with bladder stones; in fact I am going to write a Hub about that...watch for it. 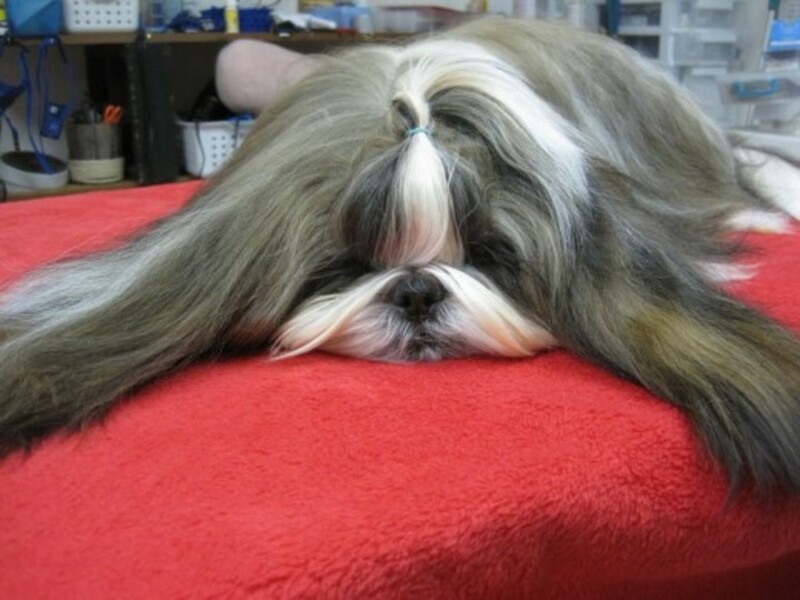 Beautiful photos, makes me want to go another Shih Tzu, they're the greatest dog! That is so nice of you to rescue another Shih Tzu dog. As to where the outfits came from...I can't answer that. My cousin's wife Judi who is responsible for all of these great photos lives in Peoria, Illinois. Let me know if you want me to contact her and see if she can leave a link as to where she got them. LOve all of these! We recently rescued our 3rd shih tzu. For Halloween I wanted to do Three Blind Mice.. where did you find those outfits?? I"m going nuts trying to find gray mice outfits! Thanks! I would agree with you that Judi has a real talent with obedience training and showing her Shih Tzu prize winners in different competitions. I really liked these pictures that she sent to me and what started this entire idea for a hub was the Merry Christmas greeting card we received in the mail this year. Glad that you also enjoyed this! Thanks for the comment. These little guys are so cute! I enjoyed looking at all the pictures. 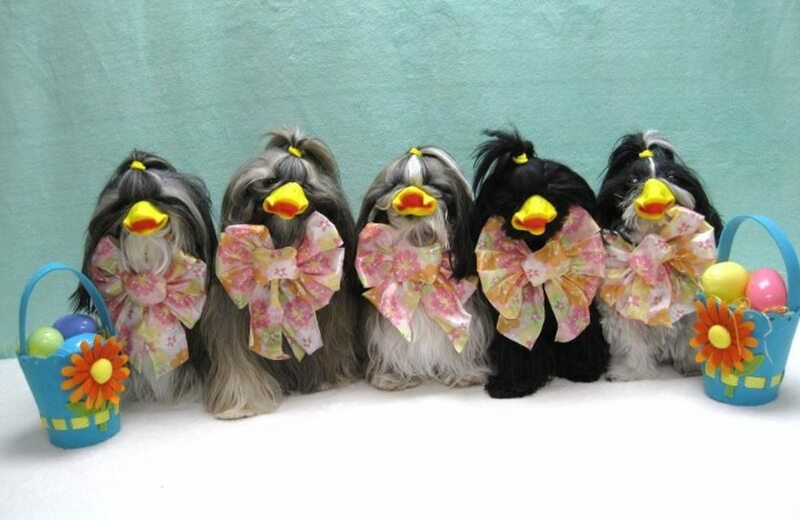 It seems like your friend has a real talent in training and showing her Shih Tzu dogs. Great Hub. 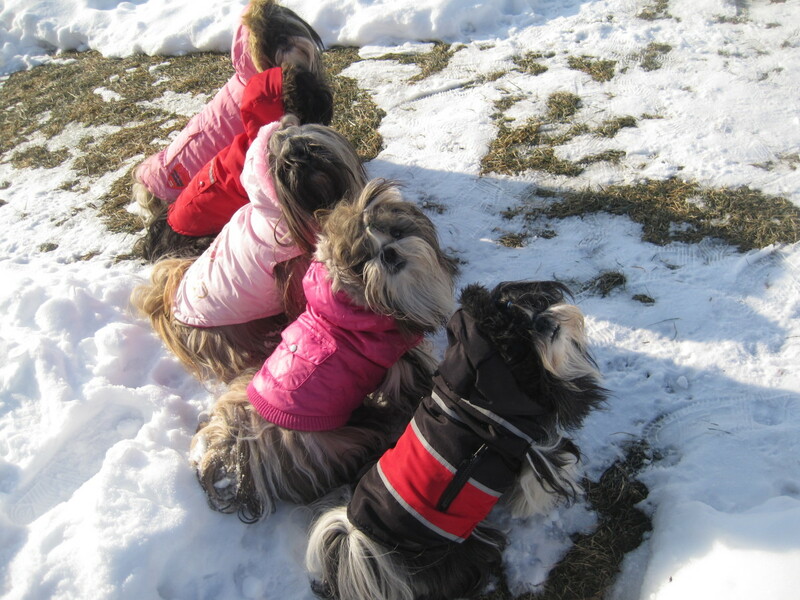 Their Shih Tzu doggies all dressed up DO look like "warm wonderful living toys!" Aptly stated! "Precious!" also fits. Thanks! Those are warm wonderful living toys! Precious! Yes, my cousin's Shih Tzu doggies are just that...gorgeous. They are also well behaved with the obedience training that they have experienced. It means training the people as well as the pups from what I have heard. Happy to have shared this Merry Christmas Greeting Card and other pictures with you and others. Thanks for the comment. They are absolutely gogeous and thank you for showing them. So glad that you liked these cute pictures of my cousin's Shih Tzu dogs and could see our Merry Christmas Greeting card from them to us this year. 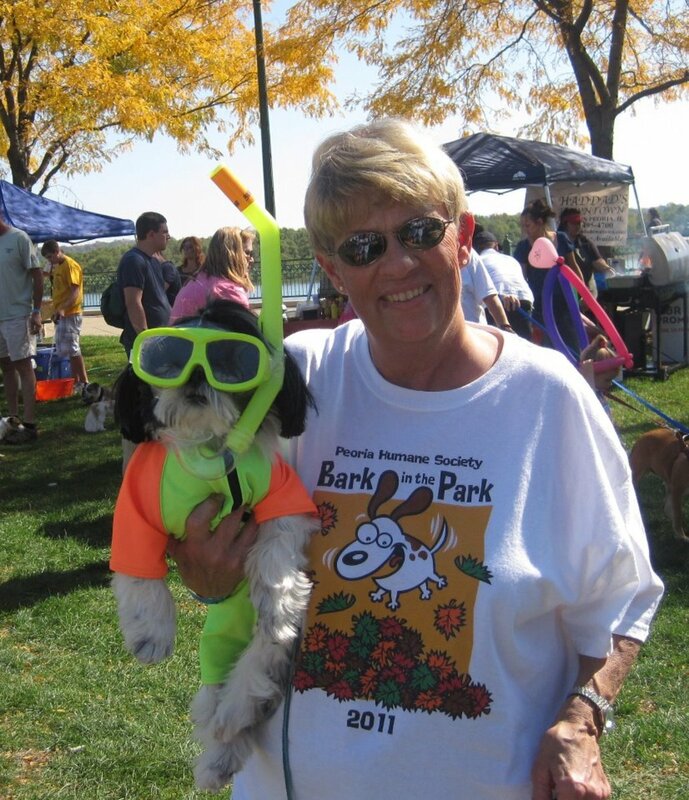 Judi's obedience training and dog grooming abilities certainly show as well as her love of dressing her pets in this type of pet wear for the contests that she enters and wins. Hope you are feeling well and wishing you a very Happy New Year ahead. 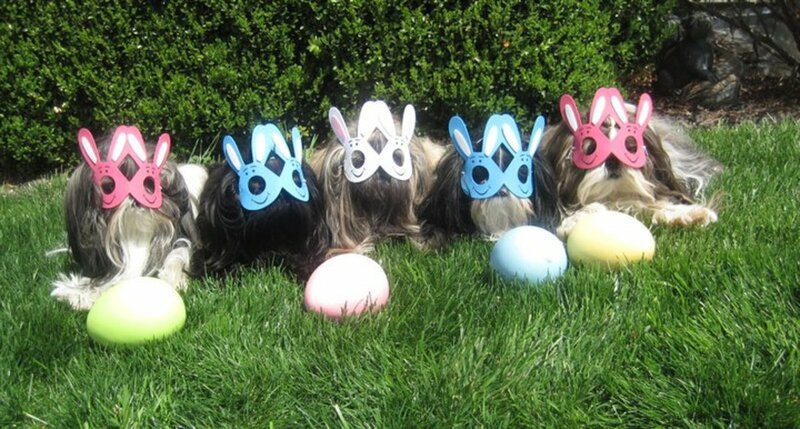 I agree with you that the creativity in dressing these Shih Tzu pets is amazing. This latest award winning picture certainly made for a cute Merry Christmas Greeting Card. These pictures would make darling note cards also. Thanks for the comment! It does not get better than this. I rate this hub at the top of the chart. They are so adorable. They will brighten any greeting card. Thanks for sharing. Hi Peggy, those are very cute pictures which make them extraordinary greeting cards, not to mention the creativity in decorating those dogs is amazing. I know. 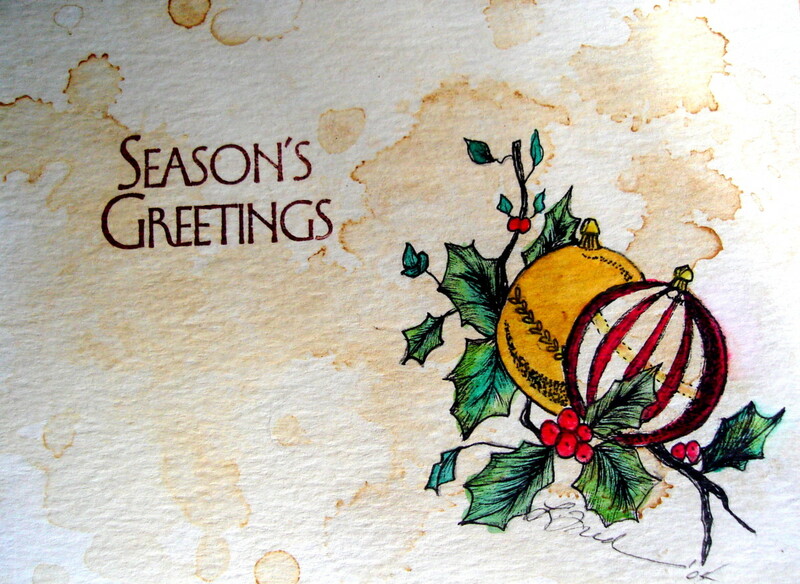 It is fun receiving the Merry Christmas greeting cards in the mail each year and catching up with people's lives. 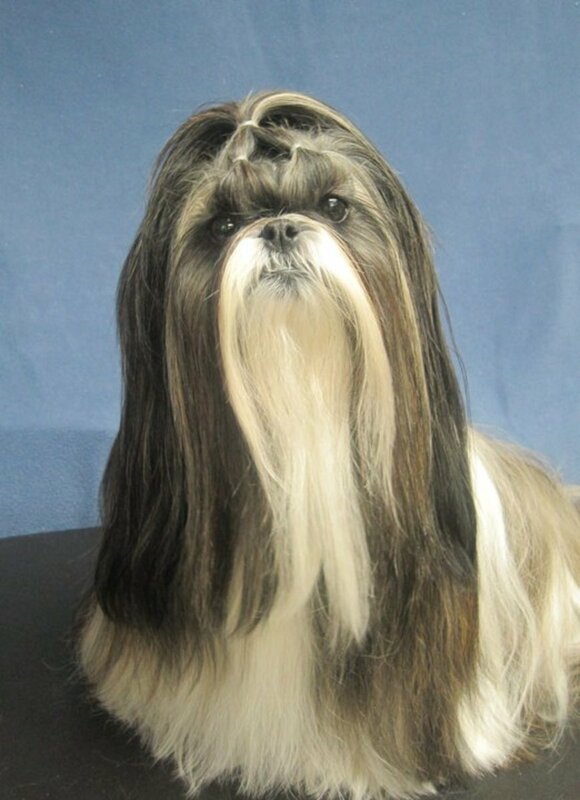 I also agree with you that the Gullickson's Shih Tzu dogs are real beauties. Thanks for the comment. 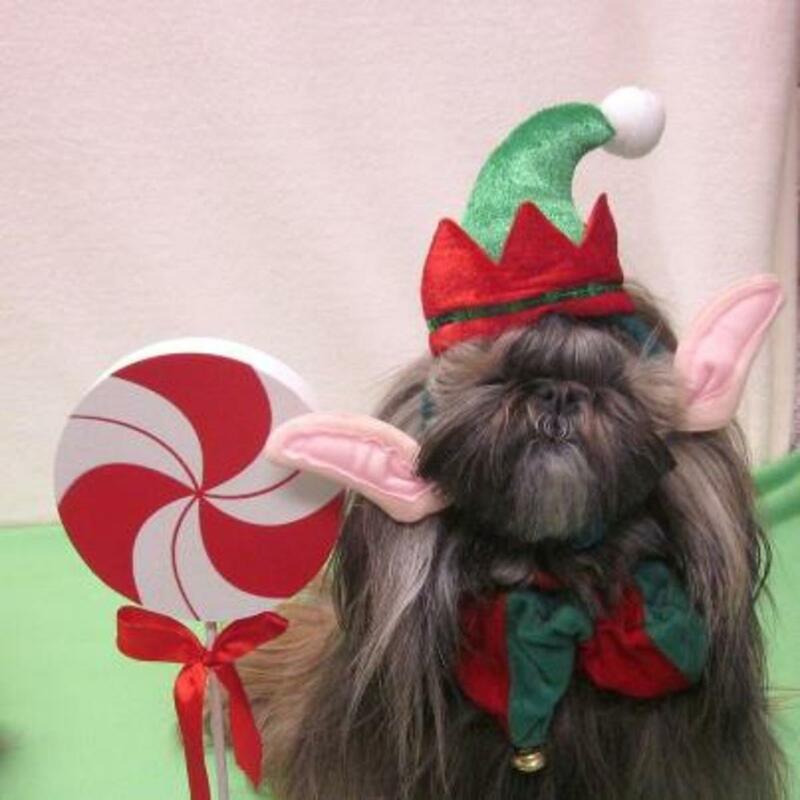 Judi will appreciate all of these comments about her Shih Tzu dogs and the creative costumes in which she dresses them for pictures. Looking at the pictures just makes me smile. Thanks for the complimentary comment. When I saw this year's Christmas card I thought that it was too cute to keep under wraps and was so delighted when Judi gave me permission to showcase their Shih Tzu prize winning dogs and tell about their obedience training and also a bit about her business of dog grooming. Happy that you liked it! Thanks for the vote up! Always a nice tradition to exchange Christmas photos - a nice way to keep up with growing families. The pets touch is nice and lots of fun - some classic Shih Tzu beauties here Peggy. Shih Tzus are the cutest dogs! I loved the costumes and creative pictures that your cousin took of them. This was a delightful hub! Absolutely adorable. 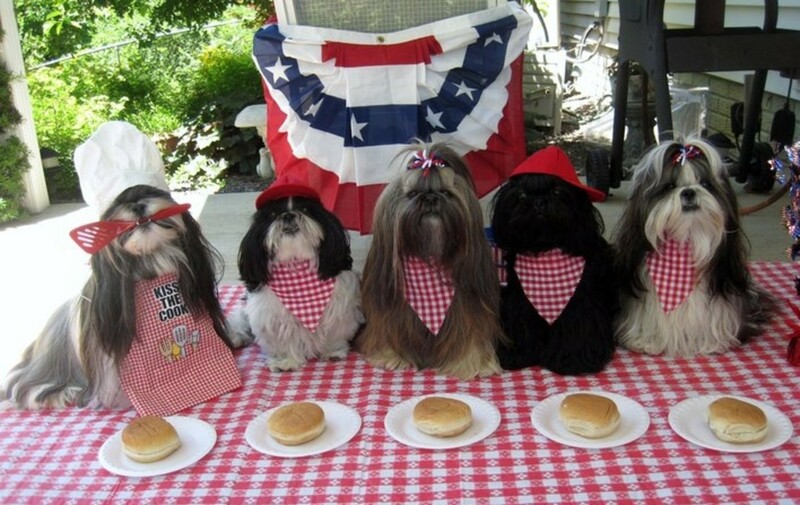 Those pictures make me want to run out and buy a Shih Tzu. Great hub, rated up. Thanks for the complimentary comments on this Merry Christmas greeting card hub with pictures of my cousin's Shih Tzu prize winning dogs. Judi is a great obedience trainer and groomer.....and photographer! I know...many people include or are substituting the Christmas letters for the Merry Christmas greeting card. Rather nice to hear what has transpired over the course of the past year for those that only communicate at this time of year. 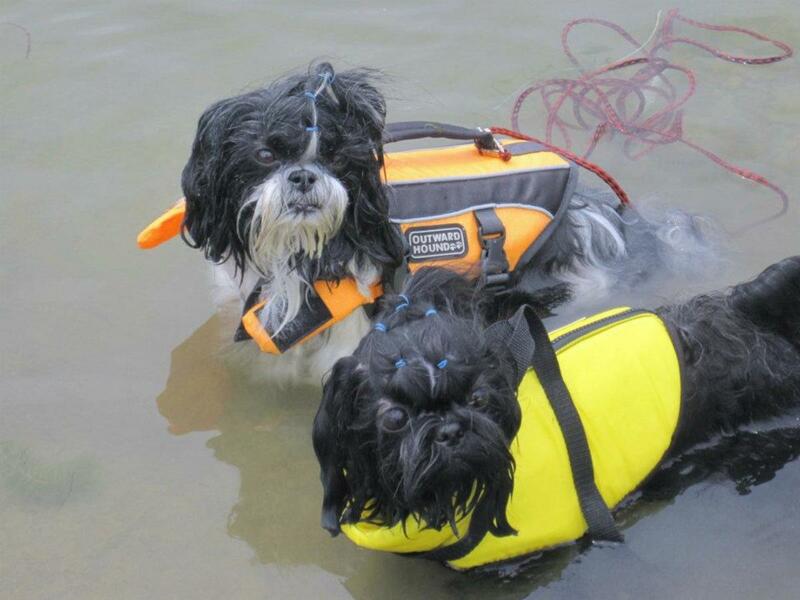 So your dogs (unlike these Shih Tzu prize winners of my cousins) don't like to be dressed. One of ours loved wearing a sweater in the winter and those of ours that we have had groomed always seemed to enjoy wearing their scarves...but every dog is different. Thanks for your comment. Will check out your link. Belated Merry Christmas to you also. Thanks for being the first to comment on this Merry Christmas greeting card with pictures of my cousin's prize winning Shih Tzu dogs. The obedience training really pays! 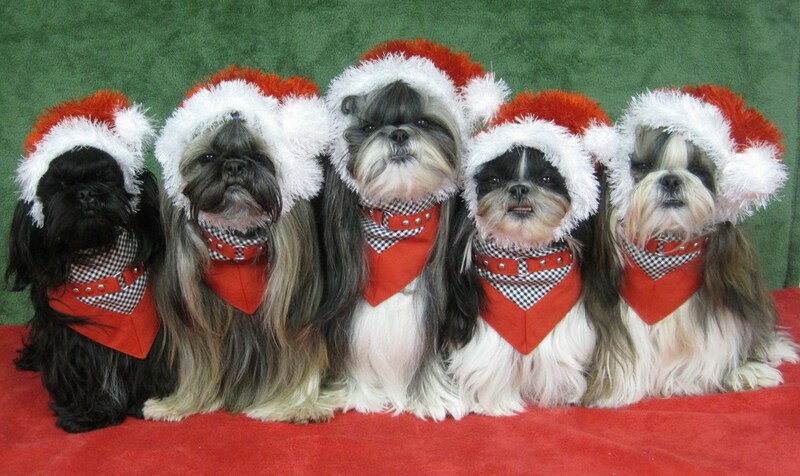 This is a beautiful hubpage on Merry Christmas greeting card with the five Shih Tzu. They are very photogenic and look like future models. Judie is a great trainer. Love your hubpage beautiful and charming. 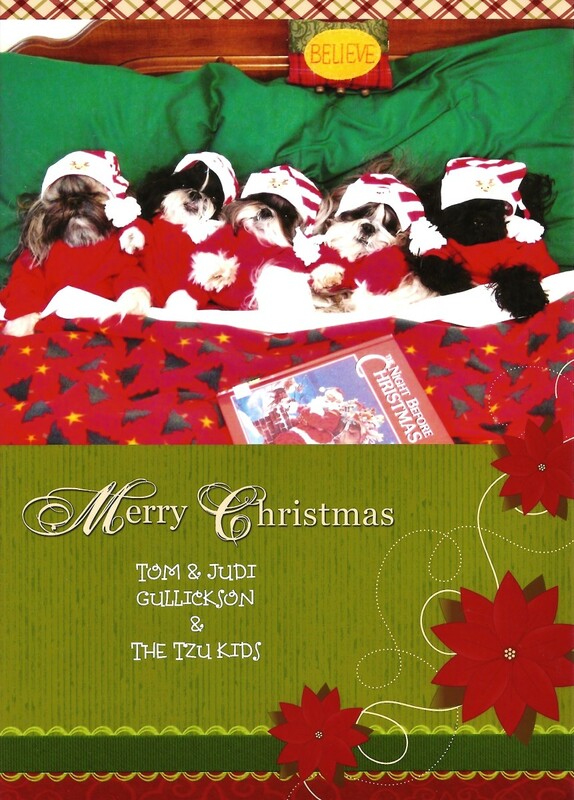 I truly adore your hubpage Merry Christmas greeting card with the five Shih Tzu. They are beautiful dogs and very photogenic. They look like professional models. A beautiful and informative hubpage. Over the years many people we exchange cards with either died or we lost touch with. So we only get a few anymore. More friends and relatives are going for the Christmas newsletter. I'm afraid our dog would not like dressing up. she doesn't even like the dog backpack we got her. If the dogs think it is fun than it is a good thing.